The Satmar Rebbe, Lubavitcher Rebbe, Rav Moshe Sherer, Rav Pinchas Teitz, and Rabbi Aryeh Kaplan all supported the Breslov effort and contributed their wisdom and guidance to the mission. With their help Rabbi Dorfman and Rabbi Maimon were able to present the Breslov community’s petition to officials from the U.S. State Department and the Kremlin. By nothing less than a miracle, the protection of Rabbi Nachman’s gravesite was placed on the agenda for the upcoming S.A.L.T. (Strategic Arms Limitation Talks) conference in Vienna. By further miracle, then-President Jimmy Carter offered it as a concession point to then-Prime Minister Leonid Brezhnev. B”H the Breslov community’s petition succeeded and the gravesite of Rebbe Nachman was preserved as “an historical site” never to be disturbed by the Soviet government. This astounding outcome also served to protect the nearby mass grave of some 30,000 Jewish martyrs of the Chmielnitsky massacres. As a direct result of these efforts so obviously blessed with success by Hashem, hundreds of thousands have been able to visit this holy site since that time. 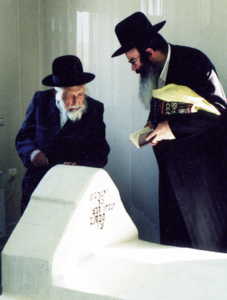 What’s most remarkable – of all the points negotiated by Carter and Brezhnev in Vienna at that time, the two super-powers were able to agree on one point and one point only: the preservation of Rabbi Nachman’s gravesite. In November/December 2011 Rabbi Nasan Maimon presented a five-part lecture series to document these events.